The Andrew James Hot Air popcorn maker arrived quickly and is extremely easy to use. It works fast and efficiently and to top it all the popcorn is fluffy and tasty. 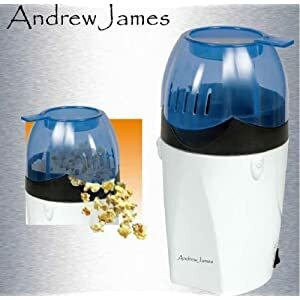 The Andrew James Popcorn Maker is easy to use without the need for butter or oil which means the popcorn make has less calories this is also helped by hot air circulation. The popcorn maker also has Cool Touch Transparent Lid which means you can watch your popcorn pop! The Andrew James Hot Air Popcorn Maker is a fun kitchen gadget.